Perhaps it’s the most important decision of your life. You are ready to love and support this man in good and bad times, for the rest of your life. Wedding vows are meant to be the expression of your most true and sincere feelings about him. Cherish that moment and write your promises to him in a sweet wedding vow that both of you will remember forever. ℘ Love is all there is. Nothing is more noble, more sincere or more satisfying than love. Love heals all and is its own beautiful reward. Love is you, my groom. ℘ Souls are created of love. And as love marries love, a beautiful new life is born. Two become one, blessed with harmony, filled with hope, united in heart. as your wife and as your friend. ℘ You are my best friend, my strong shoulder, my advocate and champion. You are my hero, and now I get to call you my husband. treasuring our friendship and love above all else but God. ℘ In the beginning, I was swayed by your charming smile. Your sense of humor and your playful ways. the joy of simply being with you. how you declare your love for me daily through words, looks, smiles, and sweet gestures. I promise to return your love throughout all the moments of our lives. ℘ My beautiful husband, I prayed for you before I knew you. And God brought you into my life; revealed to me your identity as the one. And in His unfailing love, He is giving you to me today. reminding myself that our marriage is a gift from God. ℘ I promise to be your safe space, your refuge in the storms of life. I promise to remind you of your strength, your abilities, and your worth. I promise to love you always, no matter what life may bring. You are the man I’ve longed for. ℘ Today, I am totally, unabashedly yours. I give myself to you wholeheartedly with great joy. Your well-being will be my mission and I will love you at every moment. Being able to call you my husband is fills me with delight. ℘ I met you and I loved you. Life became poetry, a song of joy expressed in love. Life became a dance, and the music is you. As your wife, I promise to never stop dancing and to love you until the end of time. you kissed life into my soul. I could never love anyone more than you. I am honored to become your wife. ℘ Your love is never silent. Steadfastly, it calls to my soul. My soul answers and our love is complete. From this day forth, our souls become one. our souls traversed the planet on a journey of love. Today they have found a home. I am honored to be your soul mate, your wife. ℘ On our first date, we held hands, and my heart began to melt. Today as we hold hands in front of our family and friends, my heart overflows with love. I promise to give you my hand always, to comfort and encourage you in difficult times, to celebrate and cheer you in times of joy. ℘ I never dreamed I could find a husband like you. You have been my defender, my protector, my comforter, and friend. I promise to love you freely and unconditionally to the very end. I promise to encircle your life with a bright and shining love that knows no end. I promise to treasure you daily, one heartbeat at a time. fully entrusting it into your hands. steadfastly and earnestly, since the day we met. with a love that is certain and true. I will treasure the beauty of this moment forever. a place where contentment and peace are found. I promise to be faithful to you and to listen to your heart. I promise to hold your hand and walk by your side throughout all the days of our lives. ℘ We have a once-in-a-lifetime love. A love built on commitment and adventure, humor and authenticity. A love that will never fail, a love that is patient and sincere. I lay my very life in your hands, trusting you to value me as much as I value you. May our promises remain unbreakable and our vows true. ℘ As your wife, I love you openly and faithfully, and I commit my life to you today. 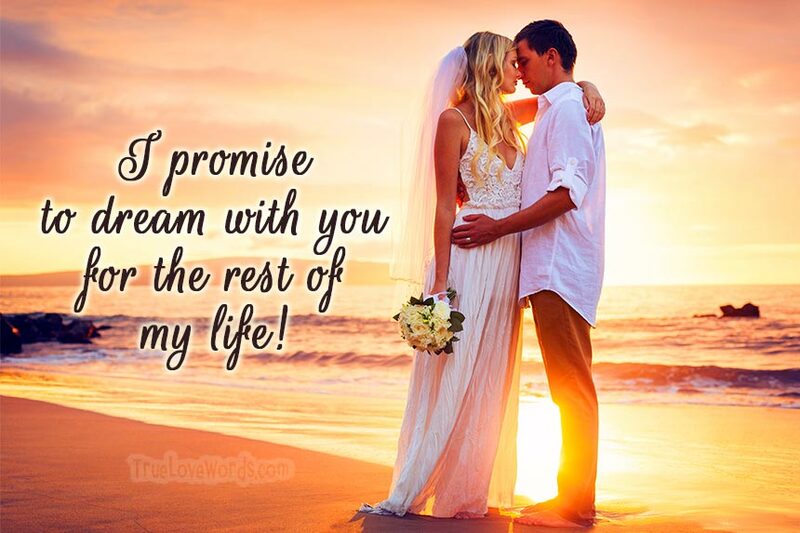 I promise to cherish each moment of our marriage and to communicate my love for you daily. I promise to be a haven in the storms of life and a stage for your successes. I will support you in every venture, and I will never stop loving you. ℘ My heart has never felt more joy than today. I have dreamed of being your bride, and finally the moment has arrived. You fulfill all my desires, and make me feel special. I promise to bring honesty, grace, peace, and happiness to our marriage and to love you endlessly. ℘ Today we choose marriage because it is unity and strength. It celebrates love and creates one from two. I choose you because you epitomize love. Daily you demonstrate loyalty, grace, and devotion to me. As your wife, I promise to love you faithfully, in honesty and respect.